L-bar sealer shrink wrap systems are great at giving a factory-crisp clean feel and look to any shape of product. This l-bar sealer keeps packages free from dust, moisture, and fingerprints. 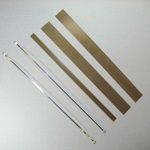 A standard l-bar sealer can cut and seal very fast. This l-bar unit is built from sturdy steel and is ideal for heavy duty use. It comes equipped with a built in timer, adjustable film dispenser rack with bearing rollers, twin perforating hole punchers and film guides. 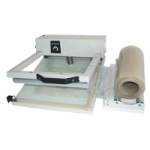 A film separator and work table are also included with this l-bar sealer. Seal Length: 24" x 32"